Humans depend on food, water, and shelter to survive. Weather influences the form and accessibility of each of these necessities of life. Since antiquity, humans have devised ways to control the temperature of interior spaces despite external weather conditions in order to maintain comfortable ambient temperatures and preserve food—early innovations of air conditioning and refrigeration. In ancient Rome with its complex system of aqueducts, cool water was circulated through the walls of wealthy homes in an early cooling system. In the third century CE, the Roman Emperor Elagabalus imported snow from the Alps and formed a massive pile of it in the garden next to his villa to keep it cooler in the summer. In second century China, artisan and inventor Ding Huan, pioneered a manual-powered rotary fan with seven wheels each three metres in diameter. During the Tang Dynasty under the Emperor Xuanzong, Cool Hall or Liang Tian, cooled by hydraulic-powered rotary fans, was built in the imperial palace. In 1758, Benjamin Franklin and John Hadley conducted experiments with the evaporation of volatile liquids like alcohol to discover that the process could lower the temperature of water past its freezing point. In 1902, the first modern electrical air conditioner was invented in Buffalo, NY by Willis Carrier. Electrical air conditioning was first introduced in movie theatres and office buildings, and today nearly 85% of US households contain at least one air conditioning unit. In most of the hottest places on earth, air conditioning is not a viable option. Sweat, manual and electrical fans, and water remain the common cooling devices. Refrigeration follows a similar trajectory. Since before 1000 BC in China, seasonal harvests of snow and ice were used to cool ice cellars for food preservation. In India, water could be cooled and even frozen through the processes of radiation and evaporation by storing it in earthenware pots on the roof overnight. Similar methods were applied in Egypt. In 1825, Nathaniel Wyeth invented a horse-drawn ice cutter, which expanded the ice trade and the use of ice boxes in the USA. In 1842, John Gorrie created a system capable of refrigerating water to produce ice. 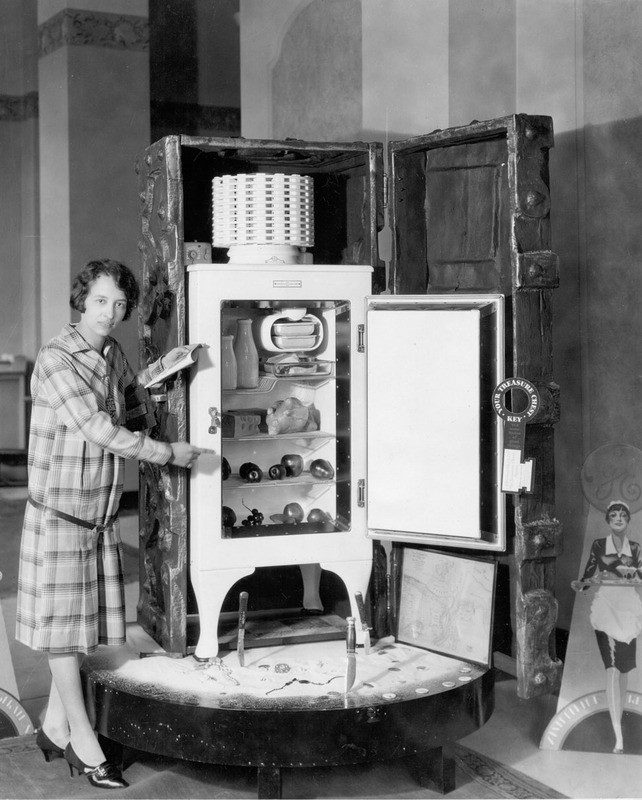 In 1927, GE released the Monitor Top, the first refrigerator to run off electricity. Throughout the 20th century, improvements were made to the technology. Today, nearly every home in the US has a fridge, and sometimes two.